This speaker is made to be portable with retractable luggage handle & wheels. This makes it easy for you to take everywhere you go. Perfect for outdoor parties, dancing activities, rehearsals, and any other occasion where portable music is needed. Inside the unit is a built-in rechargeable battery, perfect for outdoors like beach, camping, parties and more. This product comes with a charger, and you can even charge it while use it. Please charge the speaker for 12 hours before the first usage. CHARGING & FULL lights will indicate the status. Besides, in order to protect the battery, make sure it's fully charged before storage. 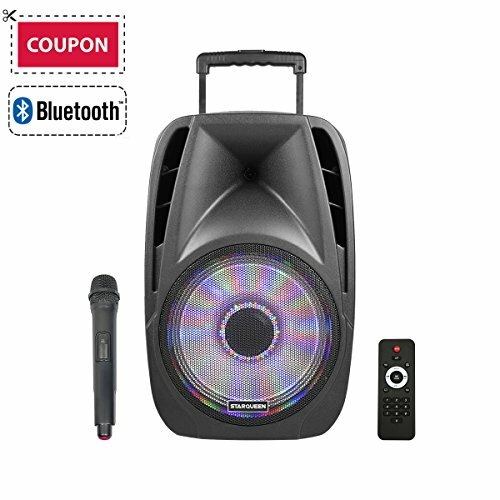 The powerful Karaoke speaker is compatible with almost all your favorite Bluetooth devices such as smartphones, tablets, laptops etc. The Bluetooth feature lets you stream from your Bluetooth compatible device directly to the unit. In addition, STARQUEEN speaker also offers Micro SD card and Flash USB connectivity. Simply load your card or flash drive and connect to your unit to get started. If you have any questions about this product by STARQUEEN, contact us by completing and submitting the form below. If you are looking for a specif part number, please include it with your message.